Each time the the newly installed OS is executed and then shutdown, even if execution only consists of logging on, a subsequent fsck will FAIL. I used Acronis True Image Home 2013 to create an image of the newly installed 64-bit Ubuntu 12.10, so I can recreate the symptoms of Ext4 filesystem corruption 100% of the time by restoring from the image, booting, logging on and shutting down. Set importance to critical due to possible corruption. Are you using any "Non-default" mount options? In an effort to KISS and minimize regression testing, I reported a 100% repeatable bug. In my haste, I failed to indicate that the source iso used burn the LiveCD was the 64-bit version of Ubuntu 12.10 which was recently released to the public. After running the installation under the Try Ubuntu path, I performed a shutdown followed by a reboot of an alternate version (12.04) of Ubuntu. A fsck -vf of the recently installed (12.10) indicated problems and I followed the prompts to repair the Ext4 file system. Acronis True Image Home 2013 was used to create an image which could be restored quickly. To create the problem, I booted (12.10), logged in, waited a while (sometimes a few minutes) and then performed a shutdown followed by a reboot of an alternate version (12.04) of Ubuntu. A fsck -vf of the recently installed (12.10) indicated problems and I followed the prompts to repair the Ext4 file system. It would seem to me that critical data can be obtained from a 100% repeatable problem in a "known" environment. The symptoms might be masked in a different version of the kernel although the problem still exists. Ernie, I see a lot of log files here, but somehow e2fsck logs seem to be missing. Any chance you have captured e2fsck messages or could recreate those? And I entirely agree with you, in my opionion just updating a recent stable kernel to a development version is not a real solution. Filesystem corruption after shutdown with a clean standard installation. 100% confirmation. 100% reproducable. But I guess it's not ext4 related. It's a dbus/networking problem with the shutdown scripts. However nobody fixed it. Though it was still reported. Busy filesystem, busy scripts, unclean shutdown. Everytime. My system: AMD64, wired Networking (forcedeth). Again, I think it's a dbus/networking/shutdown/upstart/initscripts problem. It get's triggered for some people. And it doesn't get triggered for others. That's the strange part about it. I too have had this problem since upgrading (not fresh installing) 12.10. Under my wireless connection, when I uncheck "available to all users", for each of several users, I am able to shutdown cleanly. Of course, upon reboot the "available", "not connected" and then "connected" messages are a bit anoying. I hope my experience may provide additional clues to this bugs ultimate demise. Journal recovery occurs 100% of the time; list of orhpan inodes presumably depends on the amount of unlinking in the last 5 seconds before shutdown. Oddly enough, I don't observe this on my work desktop running Ubuntu 12.10, but I do see this on three laptops - also with Ubuntu 12.04. I'll double-check this. Those specific fsck corrections --- fixing the number of free blocks and the number of free inodes --- is completely normal and is purely a cosmetic issue. There is nothing to worry about here. What is going on is that ext4 no longer updates the superblock after every block and inode allocation; that causes a wasteful write cycle to the superblock at every single journal commit, and it also is a SMP scalability bottleneck for larger servers (i.e., with 32 or 64 CPU's). To fix this, we no longer update these values in the superblock at every commit. Instead, we only update these values when we unmount the file system, mainly for cosmetic purposes so that dumpe2fs shoes the correct number of free inodes and blocks, and at mount time we calculate the total number of free blocks and inodes in the file system by summing the the free blocks/inodes statistics for each block group. So in fact, ext4 does not depend on the correctness of the values in the superblock, but it does try to update them on a clean unmount. 4. Fsck from an alternate installation will NOT throw any errors. Apparently Unchecking Enable Networking does something that a simple restart or shutdown does NOT in terms of preparing for a SAFE shutdown. Ok, I found this also on older desktops with rotational disks (all the four ones mentioned have SSDs) running Ubuntu 12.04.1. As Ted points out, it looks like Ubuntu (Upstart?) has issues with shutdown, but could there be a race exposed by the superb speed that Upstart is executing the umount/remount-ro, disk-cache-flush and kernel-reboot vector sequence? Might this have to do with anything relating to NetworkManager not connecting automatically or not detecting any connections until I disable the "Enable Networking" option, wait a couple of seconds and enable it again. Same for Wireless. Tested just in case it has something to do with it with Intel LAN Wired connections (Motherboards Intel DP35DP and Intel DZ68DB) and with Linksys WMP300N, Linksys WMP600 and Realtek Gigalan (Forgot model). All of them I need to "reset" the network like I mentioned above. The repairs reported by fsck are not caused by corruption, but are harmless and purely cosmetic fixes. The reason is that to avoid performance bottlenecks, ext4 does not update the superblock after each inode or block (de)allocation. This is done on (clean) unmount instead and only to make it look good. The filesystem does not rely on this information. The real bug is of course ubuntu not shutting down cleanly, and thus not performing the umount. Then again if this is not an error in the fs, then maybe fsck shouldn't prevent the system from cleanly booting. Hmm, somehow I missed that the actual Theodore Ts'o already commented on this here. Oops. Still though , if this is not an error in the fs, then fsck shouldn't prevent the system from cleanly booting. I have attempted to focus on a repeatable error condition. Essentially, a fsck via an alternate copy of Ubuntu would ALWAYS produce errors following simple behavior. Boot, logon, shutdown. If I keep the Enable Network option unchecked, the error NEVER occurs. Therefore it seems reasonable to conclude that networking functionally is broken. I ran into this bug and confirm it that the suggested workaround is effective. The problem does not show up if I uncheck "Enable Networking" before shutting the system down. I'm facing the same problem. Then I've read that by disabling networking before turning off the computer the problem disappears, however, after two days of turning turning off networking service and everything working fine, I've ran in the same issue, even having disabled networking. right before shutting down the system. 1-gnome-shell crashes and I lose the window borders including buttons to close them. this process fails when trying to stop services and logs me in into a root terminal. and turn off the machine manually when in starts. It is becoming urgent to solve that issue as every 2 days I need to boot with a usb drive and force a superblock correction using that tutorial. I've been using Ubuntu since 7.04 and I am at one step to completely switch to another O.S. I cannot work with so much problems. The workaround of disabling networking becomes unavailable EACH time POORLY maintained Nvidia drivers randomly cause 12.10 to crash requiring a power cycle to recover. Will this BUG be fixed before 13.04 or should I AVOID 12.10 and continue to use 12.04? Users users likely mis-correlate NetworkManager as the issue, since it changes the upstart race condition timing; most likely, this is an upstart issue, as I believe the kernel has the correct behaviour, thus it would be inappropriate to add the "kernel-bug-exists-upstream" tag. We need to remove the network-manager project association, as it is just circumstantial. Add upstart task for Ubuntu. Has anyone affected by this bug had a chance to test 13.04(Raring)? It would be good to know if this issue exists there as well, or if it is limited to 12.10. Issue have disappeared since one month on a new installation of Raring 13.04. This bug STILL occurs in 64 bit 1304 (Raring) with kernel 3.8.0-0-generic. Since one week this issue have occured again. This bug exists in 12.10 and 13.04. 1. A system crash (if you have Nvidia hardware, this will be IMPOSSIBLE due to extremely poor drivers). Another option is to boycott 12.10 and 13.04 until the problem is resolved. This bug STILL occurs in 64 bit 1304 (Raring) with kernel 3.8.0-2-generic. The thing actually got worse in Quantal, as the workaround become ineffective after a recently update. Now fsck runs on each and every boot, even if "Enable Networking" is unchecked before shutdown. Is there a way to kill all usb processes before shutdown to try and determine if the usb system is interfering with the clean unmount of the filesystem? This may need a separate bug report, if the usb system is a possible cause and other filesystems also run fsck/log replay. I agree that this has gotten worse recently and occurs on every boot. That, along with the apparent lack of 'interest in/progress on' a solution has really affected my opinion of Ubuntu and confidence in quantal. Considering the published intention to have some form of 13.04 running on a Nexus7, I would say that it is FANTASY to expect much to be fixed in 12.10 with the exception of fixes to 13.04 that can be directly backported to 12.10. @Jim Warner, does your suggestion at #10 still work for you. It works for me, if I unckeck all connections, wired, wireless and mobile. @Russell Faull, sadly no. That hasn't worked for me since the problem recurred (a few weeks ago, as I recall). We saw issues like this in Ubuntu 11.10 as well, and it was resolved by figuring out what is left running just before shutdown. This will record all open files just before root is remounted. Then after verifying that the FS was detected as dirty (please, stop calling it corrupt, it is not corrupt, just dirty) and fsck was run, upload the file /last-shutdown-lsof to this bug and we can take a look at it. (please check the content of that file. I don't think it will have any sensitive data in it, but please check before uploading as this bug is public). Judging from the reports, I doubt very much that this has anything to do with the kernel other than Ted T'so's suggestion that the kernel is simply exposing the dirty filesystem. Bug #1181528 for ureadahead/upstart issue. Unfortunately the conditions to reproduce are not clear. unrelated to ureadahead is Bug lp: #1181789.
opened for writing for other daemons. This prevents the log file from keeping the file system busy. The only downside is that anything logged by ureadahead-other goes to /dev/null instead. P.S. You will have to reboot 2 times after adding "console none" for it to work. This does seem like a bug in upstart. It seems to me that there needs to be a command to say "upstart, close all of your log files and do not reopen them" so that one can remount / readonly. Systems may have things that want to keep running right up until poweroff/reboot, but that make use of 'console log'. AFAIK this bug exists since 12.10 and I have no idea why it still doesn't fixed. In my case the bug with unclean shutdown happens only when my machine (Thinkpad X230) is docked to the Thinkpad ultrabase when shutting it down. When I shutdown outside of a dock, everything is fine. I don't use ureadahead (have SSD), doesn't matter if there are mounted network filesystems or not, if NetworkManager is running or not. My problems (on current saucy) were caused by bugs in upstart (affecting ureadahead) and network-manager. The patches in bug #1181789 and bug #1169614 give me a clean unmount and shutdown. 2) killing dhclient in umountfs. Dmitry, I confirm your solution. I already uninstalled ureadahead (no need for it with a SSD). I added killall dhclient to my /etc/init.d/umountfs (at the beginning of the do_stop function). This problem happens for me only when I use the regular wired ethernet on my ThinkPad X230 (not just when the laptop is docked to the UltraBase as I've reported earlier) . It doesn't happen when I'm using wireless. I've tried patches in mentioned in comment #137, but they didn't help. This still happens in 13.10 (saucy). This time I installed the Beta-2 of Lubuntu (thus using an lxsession). Reboot or shutdown fails everytime. It hangs for around ten seconds, then it reboots and fsck shows "deleted orphaned inode". Only helps to uninstall network-manager-*, nm-*, modemmanager, ureadahead. Yeah, still exists in 13.10. I'm seeing this in 13.10 as well. It occurs that the problem did *not* exist after a recent clean install of 13.10 (64bit Desktop CD) on a friend's notebook. While it still happens on my desktop PC. On the notebook we used wireless (b43 out of the box) internet during installation. Reboot into new system, login, shutdown is clean. On my desktop I have no wireless card at all. I use wired connection during installation. Reboot into new system, login, using system, shutdown is unclean. I haven't double-checked this though. But it maybe is a hint, that this problem occurs on machines with no wireless possibilities. connections persist right to system shutdown?? > happens on my desktop PC. > installation. Reboot into new system, login, shutdown is clean. > problem occurs on machines with no wireless possibilities. I did a bit of hacking on init.d/umountroot, adding lsof and ps -ef after the remount fails. It seems like there is a problem in the upstart init where it is not closing files, besides the problem with dhclient. have a problem in your /etc/fstab (non-existent devices). > closing files, besides the problem with dhclient. rather than trying to track them all on a single metabug. > connections persist right to system shutdown?? practice they may leave lingering bits briefly after that. What the heck network-manager and network connections are you talking about?! This really pissed me off already! As I've said earlier, the problem is NOT in network-manager! because it appears even when network-manager is not installed. You can see my comments (and debug logs) about this problem above. That was the boiling point. > common issue being described here. Rather than doing this to help yourself, you switch distros, decide that upstart is to blame for a part of the system that is clearly managed by another package, and stay subscribed to the bug so that you can yell at people who are experiencing the bug that was originally reported - a bug that is unrelated to the issue that you were experiencing? This bug tracker is for helping users resolve bugs in Ubuntu. If you're not using Ubuntu, and you're not helping fix the bugs, your comments are not needed here. > What the heck network-manager and network connections are you talking about?! > This really pissed me off already! > As I've said earlier, the problem is NOT in network-manager! > because it appears even when network-manager is not installed. > You can see my comments (and debug logs) about this problem above. > That was the boiling point. > I've moved to Debian. come back when you have helpful constructive comments. Regardless of that one comment above. But it is really frustrating if now the user's of ubuntu get blamed for not filing the correct bug. Dear folks at Canonical, you have so much information in this one thread, about how to reproduce this error. I'm not that experienced. So please, could someone reproduce this error (take a machine without any wireless capabilities) and then file the correct bug, if this bug report here is not "good enough" for you. It's pretty amazing that a bug that causes **filesystem errors** (if minor or not minor) does not get fixed at all and now the users get partly blamed for not filing the bug on the correct package? Hello? A default installation causes filesystem errors, reproduceable. Would someone please take those hints in this thread seriously? Like: install on a machine with a wired connection on no wireless adapters. I can reproduce this 100%. My fix is (taken from this thread): "console none" in /etc/init/ureadahead-other.conf OR uninstalling ureadahead at all. That worked for me. I don't know what package to file this bug against, because it seems that it happens out of certain hardware and interaction between different packages. I'm not blaming upstart at all. I just want this CRITICAL bug to be fixed. It is around since 12.04/12.10. That's "amazing". I have tried some workarounds from the comments and nothing seems to work. Fsck still runs at every boot. Bootchart included. if there ane running processes at that moment that root is remountet or unmounted at shutdown or halt then fsck will complain on next boot. In my case it's a dhclient process that likely respawns and prevents remount to read-only of root fs, due to a lease file opened for writing under /var/lib/NetworkManager/.. Result is unclean shutdown and recovery of dirty root file system on next boot. 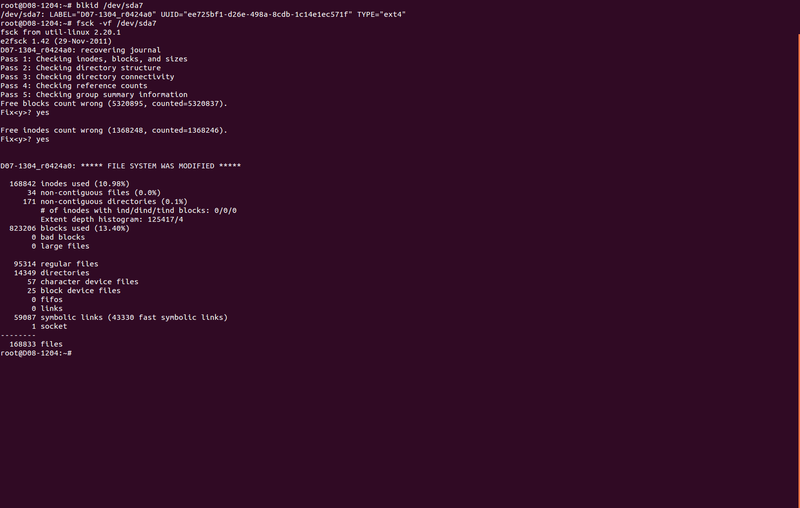 Attaching lsof output obtained just before call to umount in /etc/init.d/umountroot. Clean Ubuntu 13.10 installation. This has certainly become an annoying and long lasting bug now. I'd guess patch in bug 1169614 would help in my case (dhclient process). Any progress on evaluating and possibly including the patch provided in that bug ? can happen), but it's not "nice" either. previous posts properly, etc., etc. shutdown problems affecting a lot of users. > Last time I did, my own problems were caused by dhclient and ureadahead.. It is not an ureadahead issue, it is an extra fork in upstart to launch shell for ureadahead if more than one partition mounted. all of upstart's library dependencies, which are finite and accounted for. > all of upstart's library dependencies, which are finite and accounted for. for remounting it read-only anymore. > see when something misbehaves. the problem cases somewhere that Lennart apparently isn't seeing them. sysvinit that should help us gather this information. > > Last time I did, my own problems were caused by dhclient and ureadahead..
> shell for ureadahead if more than one partition mounted. Yes, I know - I was summarizing! > sysvinit that should help us gather this information. a few months.) I'm updating my images as we speak. 14.04 — it's still a problem (dhclient issue). Looks like bug #1169614 was finally fixed.